Montanes was capturing the fourth title of his career on the ATP Tour and second in a row at Estoril. 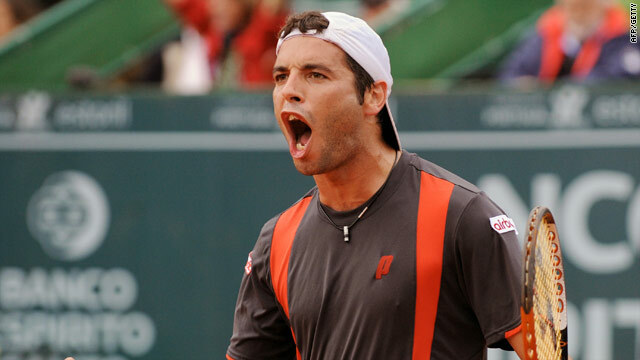 (CNN) -- Spaniard Albert Montanes successfully defended his Estoril Open title in Portugal with a 6-2 6-7 7-5 victory over home hope Frederico Gil. Montanes, who beat world number one Roger Federer in the semifinals at the Estadio Nacional, was made to work hard for his victory against the unheralded Gil. He trailed 0-3 in the deciding set before hitting back to win in two hours 34 minutes. It was his 10th straight victory at the clay court tournament. "It feels great to defend the title, my fourth career title," Montanes told the official ATP Web site. "This is a special place for me and I'm happy to have won it again. "I am definitely playing the best tennis of my career and if I keep playing like that I think I can break into the Top 20." In other ATP Tour action in the build up to the second grand slam of the season at the French Open, Mikhail Youzhny of Russia won the BMW Open in Munich with a battling 6-3 4-6 6-4 victory over top seed Marin Cilic. Youzhny had finished runner-up at the same tournament on 2007 and 2009 and victory ended a run of three defeats in finals, the last to Novak Djokovic in Dubai earlier this year. The 27-year-old had a 3-0 career advantage over his Croat opponent going into their showdown but was made to fight hard for his eventual victory. Meanwhile, Sam Querrey became the first American since 2003 to win a European clay-court title as he beat compatriot 3-6 7-6 6-4 in the final of the Serbia Open. Querrey had to save a match point in the second set against the giant Isner before leveling the match and then taking the decider in Belgrade.